1. On your phone open up the ‘Mail’ app that comes with your Android phone. 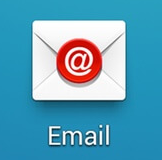 On your phone, this is the app with the red @ symbol over the envelope by default. 2. When you load up the application for the first time, it may have your already configured Gmail account otherwise select ‘Add New Account’. 3. Here you need to put in your user-name and password for the email account. Tap on ‘Show Password’ to ensure you don't misspell the password. Once done click on ‘Sign In’ at the bottom of the screen to proceed. 4. The device will now try to ask which type of account to set. For this guide, select ‘IMAP’ if you’re unsure. Username The full email address. This is the biggest problem with Samsung, as usually it will only add the username shortened and not include the @domain part. Once complete, tap on ‘Sign in’ at the bottom of the screen to process the settings. I still get errors that I can't connect my Samsung to my Openhost email? Most likely wrong credentials. Especially in step 5, make sure that have the full username set, if you save it with the incorrect username you’ll have to remove the account and start again. Also, try login to https://webmail.<domain>/ which is the online login for your emails. If you can’t log in to here, you will have the wrong password and need to reset it to a new one. I can receive, but I can’t send? This is most likely a network issue. If you’re on 3G/4G, try to connect on a wireless connection or vice versa for the interim. Can I use other ports? Yes of course, if you are familiar and understand how different network ports work you may use other settings of your choosing. I’ve followed everything, but I still can’t get my Samsung to connect to Openhost email? You will want to contact your IT provider for further assistance. We have thousands of emails connected using the ports and settings listed above, but we can’t diagnose issues that are isolated to just your phone as we’re not trained nor do we provide support for Samsung.